The Supreme Court Bench, comprising Justice J. Chelameswar and Justice A.M. Sapre upheld the validity of Haryana Panchayati Raj (Amendment) Act, 2015 (Act 8 of 2015), which introduced the minimum educational qualification for candidates to contest the Panchayat elections. It held that both the rights namely “Right to Vote” and “Right to Contest” are not fundamental Rights but only constitutional rights of the citizen. The Supreme Court on Tuesday said it would ban registration of diesel vehicles having engine power of more than 2000 CC like the SUVs and luxury sedans till April 1 on a trial basis. The rich cannot be allowed to move around in expensive diesel vehicles when they can afford petrol vehicles, Chief Justice T S Thakur noted. Supreme Court directed all the States to immediately take steps for constituting a three member Waqf Tribunal, mandated by Section 83(4) of the Waqf Act. Apex Court Bench comprising of Justices M.Y. 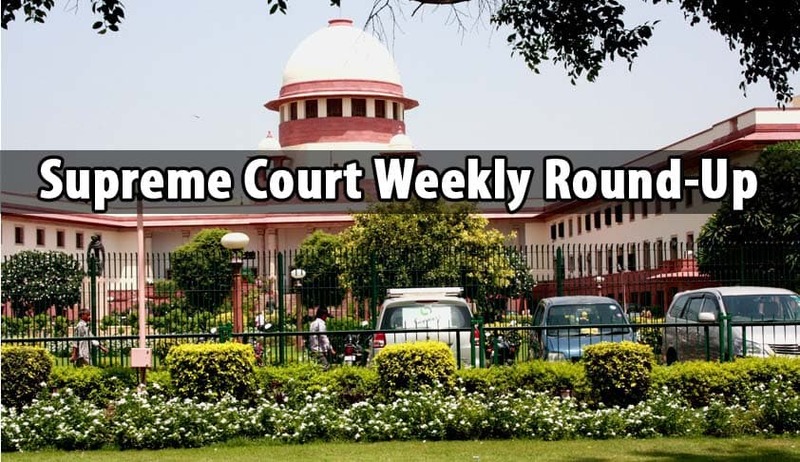 Eqbal and C. Nagappan said it takes serious exception to the conduct of the States who have not till date issued fresh notification constituting three member Tribunal, after 2013 amendment mandated the same. The court also has directed the states to issue notification within four months. In a rare order, the Supreme Court on Wednesday, exercised its Constitutional authority and appointed former High Court judge, Justice Virendra Singh, as Lokayukta of Uttar Pradesh. A bench headed by Justice Ranjan Gogoi went ahead with the extraordinary task invoking its powers after the State government failed to comply with its repeated directives. The bench examined a list of nominees and ordered the appointment. Expressing its disappointment over the “shoddy, casual, laconical and insensitive” investigation conducted by the police in a case wherein the accused was ultimately acquitted by the Supreme Court of all charges in an appeal preferred against the concurrent findings of guilt entered against him by the courts below, the Supreme Court, in a judgment rendered on Thursday, sought to remind the investigating agencies of their responsibility of securing the safety and security of the citizens and in the process, act as the protector of human rights. Supreme Court held that ‘amrutamanohi’ properties which are vested in favour of the Lord Jagannath Temple at Puri by virtue of the provisions of the Temple Act, 1955, cannot be called ‘Trust Estates’ and consequently it has struck down the first part of the proviso of Section 2(oo) of the Orissa Estate Abolition Act, 1951, which pertains to the properties of Lord Jagannath Temple at Puri. Division bench of Justices V. Gopala Gowda and C. Nagappan also quashed notification issued by the State Government in this regard. The Supreme Court on Monday, appointed former Supreme Court judge Justice P V Reddy to revalue 659 answer sheets of Delhi Judicial Services (Mains) exam 2014 following allegations of several irregularities and discrepancies. The Supreme Court on Tuesday, issued notice to Gujarat government on a fresh petition filed by Patel quota agitation leader Hardik Patel against High Court order refusing to quash sedition charge against him for allegedly attacking places like police stations in the state. The Supreme Court on Wednesday said popular Maggi noodles will now be tested in an accredited laboratory at Mysore and not in Chennai as sought by the National Consumer Disputes Redressal Commission (NCDRC). The apex court also stayed the proceedings in the case pending in the apex consumer body. Exactly two months after scrapping the NJAC Act, a constitution bench of the Supreme Court which had embarked on a mission to improve the collegiums system on Wednesday, virtually put the ball back into the government’s court by giving the Centre the liberty to finalise a draft memorandum of procedure for appointing judges to the Supreme Court and High Courts in consultation with the Chief Justice of India. Coming down heavily on the Reserve Bank of India (RBI for short) for depriving information under the RTI Act, 2005 in the name of fiduciary relationship between itself and the banks, the Supreme Court, in a landmark decision declared that RBI does not place itself in a fiduciary relationship with the Financial institutions because, the reports of the inspections, statements of the bank, information related to the business obtained by the RBI are not under the pretext of confidence or trust. Supreme Court of India issued directives, in addition to its directions issued vide order dated 9.10.2015, with a view to ‘mitigate the hardship which the people living in Delhi undergo having regard to the high of pollution in the city’. The Supreme Court of India, in Adi Saiva Sivachariyargal Nala Sanga vs. Government of Tamil Nadu, held that appointments of Archakas in temples will have to be made in accordance with the Agamas, subject to their due identification as well as their conformity with the Constitutional mandates and principles. Apex Court bench comprising of Justices Ranjan Gogoi and N.V. Ramana made this observation while disposing of a batch of Writ petitions filed against Tamil Nadu Government order regarding appointment of Archakas in temple. The Apex Court on Thursday, admitted and issued notice to the Central government and 11 States in a Public Interest Litigation (PIL) filed by Swaraj Abhiyan seeking necessary relief and compensation to drought affected farmers and other classes of citizens. Supreme Court gave quietest to a property dispute between cousins of a family in Uttar Pradesh, which arose in a suit filed in 1978. The Apex court bench comprising of Justices Ranjan Gogoi and N.V. Ramana held that, though a women could not be treated as Karta of a joint family, she can be a manager of a joint family, in some particular circumstances. The bench also held that the expression ‘Manager’ can be understood as denoting a role distinct from that of the Karta from that of the Karta. Supreme Court of India asked every employer, State and Private, to conclude departmental inquiry proceedings within six months. Apex Court bench comprising of Justices Chelameswar and Abhay Manohar Sapre made this observation in Prem Nath Bali vs. Registrar, High Court of Delhi.